Let’s cut away all the fluffiness and cut right to the bone. Steve McQueen is maybe the coolest actor to ever work in Hollywood. An underrated actor who had an incredible on-screen presence, he had his biggest success and popularity in the late 1960s. The Cincinnati Kid, Nevada Smith, Thomas Crown Affair, The Sand Pebbles, all excellent parts in good to great films. Nowhere was McQueen more at his coolest than 1968’s Bullitt. A respected and hard-edged San Francisco detective, Frank Bullitt (McQueen) has been tasked with a somewhat dull but essential task from ambitious politician Walter Chalmers (Robert Vaughn). Prepping for a Senate hearing about a Mafia takedown, Chalmers has enlisted a key witness (Felice Orlandi), and Bullitt and two other detectives must babysit him over a weekend until the hearing. Instead, the witness is killed by two assassins, forcing Bullitt to find out what’s going on. Something doesn’t fit together as he examines the clues and evidence, but the pressure is on. Chalmers needs a scapegoat, and Bullitt seems like the perfect target to take the fall. Knowing he’s been backed into a corner, Bullitt has an extremely limited window to find out exactly what’s going on. The late 1960s were one of the most influential periods in Hollywood history, changing the way films were made and more importantly, the stories that were told. 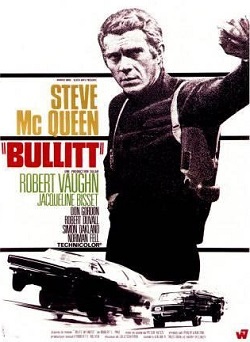 From director Peter Yates, ‘Bullitt’ is a police/cop movie like none before it. It is a smart, stylish cop drama/thriller that gets better with each viewing. For starters, it was filmed in San Francisco, setting the stage for Dirty Harry, McQ and a whole cop genre to move into the city. It is an ideal backdrop for the story; a polished, good-looking city that is nonetheless hiding secrets. The score from Lalo Schifrin is a good mix of quiet, soothing jazz and faster-paced, more traditional yet still exciting musical cues (listen HERE). The style in an almost documentary-like fashion reflects some of the French crime thrillers that I’ve really come to appreciate, giving ‘Bullitt’ a different edge more than just the same old, same old cops and robbers story. That starts with Steve McQueen as Detective Frank Bullitt, a veteran cop who always gets the job done but usually how he wants to do it, not how he should do it. That basic write-up is as cliched as the countless cop movie stereotypes that have been done to death in the years since, but McQueen gives the lead performance a different edge. Never one for huge dialogue scenes, McQueen’s Bullitt is a huge presence whenever he’s on-screen. He does more with a look here or there than many actors could do with an entire monologue with the camera trained on them. There’s a self-assured confidence in the part, a quietness about it too. Bullitt is an expert at what he does, but he’s not interested in fame or accolades. He does it because he’s really good, so good that he’s become almost desensitized to the violence he sees on a daily basis. McQueen = cool. Okay, so we’ve talked about the plot, Steve McQueen’s badass-ness (is that a word? ), and hhhmmm, what else? Oh, right, the cars. Some 45 years since its release, ‘Bullitt’ is still remembered fondly for an infamous car chase that opened the door for countless knockoffs, remakes and retries. Driving his 1968 Ford Mustang, McQueen pursues two assassins (driver Bill Hickman, killer Paul Genge) in, around and through San Fran, two muscle cars going at it for everything they’re worth. Schifrin’s soundtrack is left by the wayside, just the sounds of the two engines doing battle providing all the soundtrack that’s needed. Looking back on it now, it isn’t a flashy sequence, but it is clear how much it has influenced just about every movie car chase since. It is an extended sequence that runs about 10 minutes total (near the film’s halfway point), one that will definitely get the adrenaline pumping. Now sometimes at the expense of the film’s style is the film’s story. It took me 3 or 4 viewings to really get everything down just right. Not to throw this out there as a cop-out, but an understanding of the story isn’t a must here. You watch for the style. Some reviewers/critics have an issue with the pacing, some point-blank stating that it’s a boring movie. It isn’t an action-packed movie, that’s for sure. ‘Bullitt’ takes its time but always knows where it wants to go. A chase through a hospital is subtle and underplayed but incredibly full of tension, as is the finale at the San Francisco airport as Bullitt chases a suspect across runways in use. We see little departures into San Fran with Bullitt’s girlfriend, Cathy (Jacqueline Bisset), on dates and at work, to Bullitt’s apartment, to follow up with witnesses. It’s rarely flashy, but there’s something charming just the same about that assured style. Backing McQueen up, Vaughn does what he does best; gentlemanly slimy to perfection. His Chalmers is smooth and suave, but he’s really a snake waiting in the grass to strike. Don Gordon (a longtime, close friend of McQueen) is nicely cast as Delgetti, Bullitt’s longtime partner with Simon Oakland and Norman Fell as their superiors. Also look for Robert Duvall in a small but key (and effective) part as a cab driver whose help Bullitt enlists as he tries to figure everything out. One of my favorites, an iconic flick from the 1960s, and one of Steve McQueen’s all-time bests. Haven’t seen it? What’s wrong with you?!? Highly recommended. This entry was tagged 1960s, Don Gordon, Robert Duvall, Robert Vaughn, Simon Oakland, Steve McQueen.